Fayette County Commissioner Jack DeWeese signs a proclamation declaring the month of September to be National Recovery Month in Fayette County. Sitting beside him is Kylena Francis, Drug Free Communities Program Director. Behind the table stand County Commissioner Dan Dean and AmeriCorps VISTA at the Fayette County Community Action Commision, Tracy Callendar. 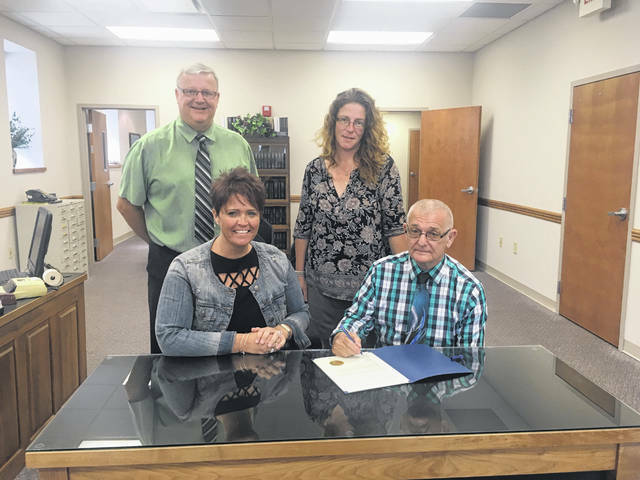 https://www.recordherald.com/wp-content/uploads/sites/27/2018/09/web1_IMG_2297.jpgFayette County Commissioner Jack DeWeese signs a proclamation declaring the month of September to be National Recovery Month in Fayette County. Sitting beside him is Kylena Francis, Drug Free Communities Program Director. Behind the table stand County Commissioner Dan Dean and AmeriCorps VISTA at the Fayette County Community Action Commision, Tracy Callendar.